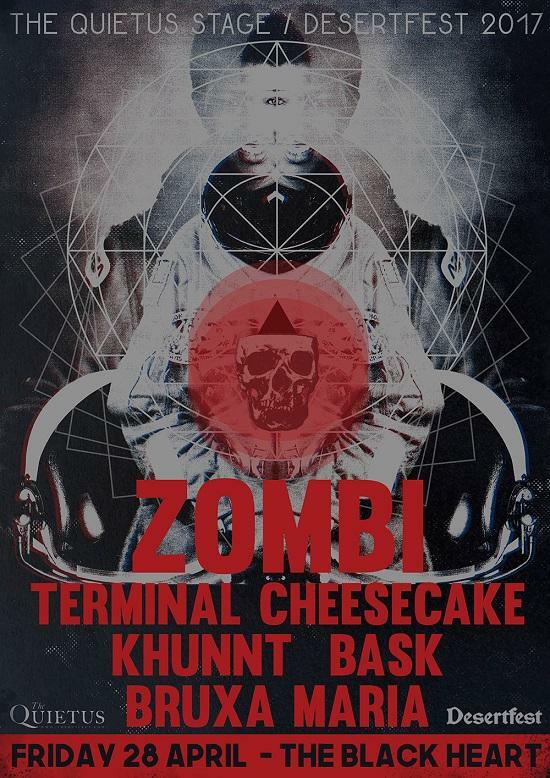 The line-up for this year's Quietus stage at Desertfest has been announced, with supreme synth-prog duo Zombi set to headline our fourth annual curation at Camden's Black Heart on Friday 28th April. Elsewhere on the bill, bona fide legends of psychedelic noise Terminal Cheescake are set to cause mayhem, as are outstandingly heavy Newcastle maniacs Khünnt. Bruxa Maria makes a welcome live return having wreaked havoc at tQ’s winter party at Corsica last year, while Bask's unique blend of sweeping Americana and savage sludge completes the bill. As tQ's Jamie Skey reported from last year’s event, "Desertfest is a serious matter for the thousands of metal insiders who gather here. The festival has, in its short life span, won over so many hearts and weed-addled minds that it’s been granted annexes in parts of Europe (Antwerp and Berlin). But Camden remains its spiritual home, and the great and the good of metal, in all their patched-denim splendour, have hit the pavements to feast on some of the genre's gnarliest exports." Elsewhere at Desertfest, Sleep and Slo Burn top London’s heaviest bill, with full details and weekend tickets available now at their website.